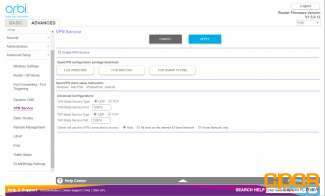 Before we dive in, let’s first take a quick look at the specifications. 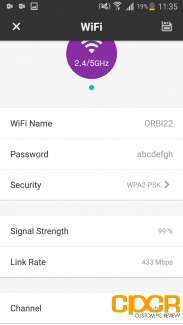 Here we can see that the Netgear Orbi is very well equipped, sporting a quad core 710MHz Qualcomm processor paired with 512MB of RAM. Each Orbi packs three radios (2.4GHz + 5GHz + 5GHz) with one of the 5GHz radios serving as a dedicated backhaul. Paired with the backhaul 5GHz radio is a dedicated 4×4 MIMO antenna setup and paired with the other two 2.4GHz and 5GHz radios are 2×2 MU-MIMO antenna setups. 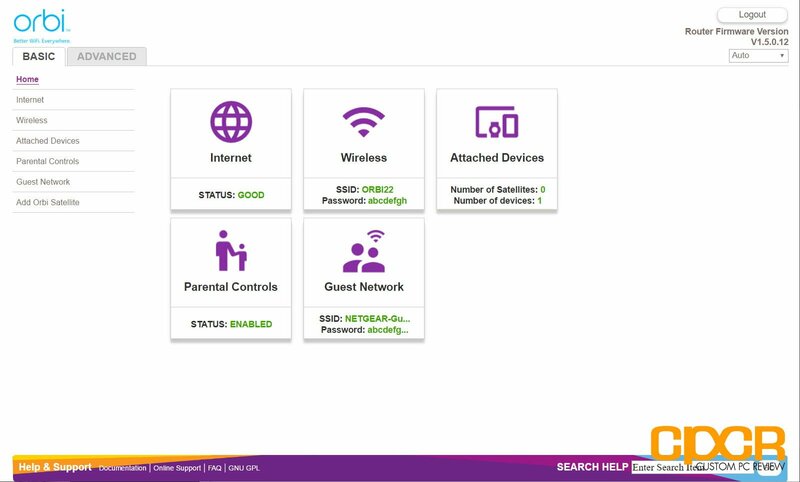 Here’s a look at how a mesh Wi-Fi network with Netgear Orbis look like. The Orbi’s claim to fame here is the dedicated 5GHz 4×4 MIMO backhaul that should provide better performance when compared to mesh Wi-Fi systems that do not have dedicated backhaul functionality. 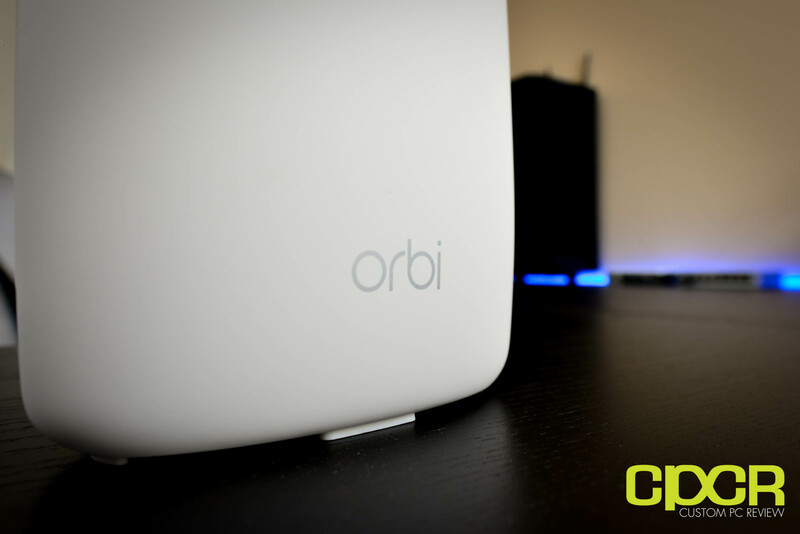 Let’s take a closer look at the Netgear Orbi. Here’s a look at the packaging for the Netgear Orbi. 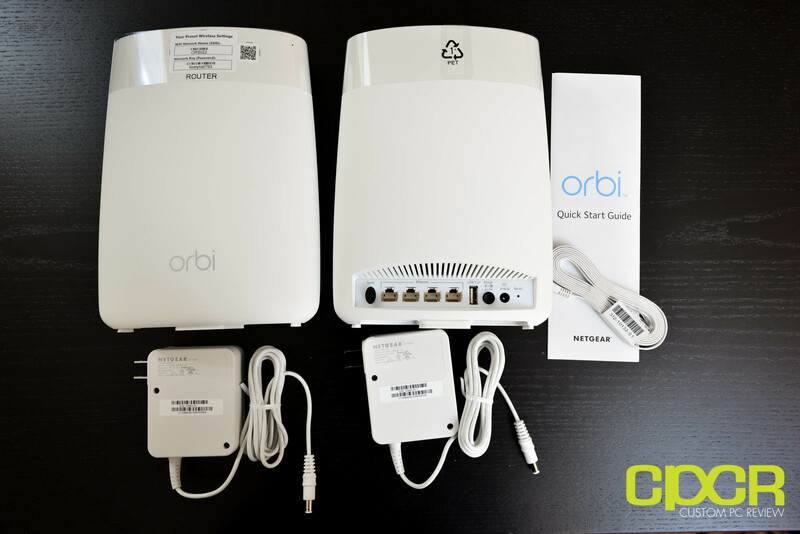 The model we received is the Orbi RBK50 which is a two Orbi kit. Netgear also sells the Orbi as a standalone as well as an Orbi three pack. Included in the packaging is documentation, an Ethernet cable, two Orbis, and two power adapters. Here’s a closer look at the Netgear Orbi. 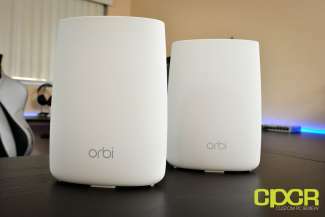 Like every other mesh Wi-Fi system on the market, it doesn’t look like a traditional Wi-Fi router and in the Netgear Orbi’s case it looks more like an air purifier or a humidifier. While the Orbi is not a big device, it’s not small either, measuring 8.89 in tall, 6.67 in wide and 2.36 in deep. Looking at the Orbi, it’s fairly plain with only the word Orbi at the front of the unit. At the bottom of the rear we get all the connectivity options which includes four Gigabit Ethernet ports, a USB 2.0 port, and a DC in port. There’s also a few physical buttons back here as well including a sync button, a power button, and a recessed reset button. 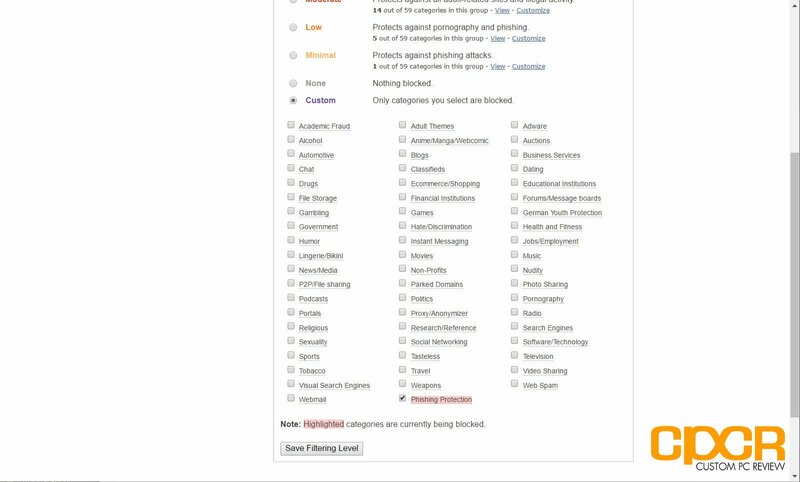 At the bottom is information about the device which includes default usernames, default passwords, and the default SSID as well. Of course, all of this can be changed later on. 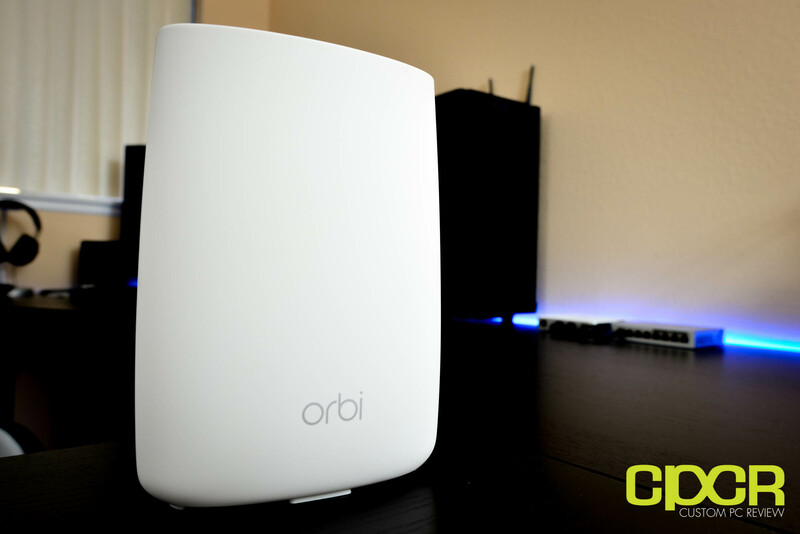 Unlike most other mesh Wi-Fi systems we’ve seen, the Orbi differentiates the design of the base station and the satellite nodes. The major difference between the Orbi base station and satellite nodes is the color up top with white signifying a base station and blue signifying a satellite unit. 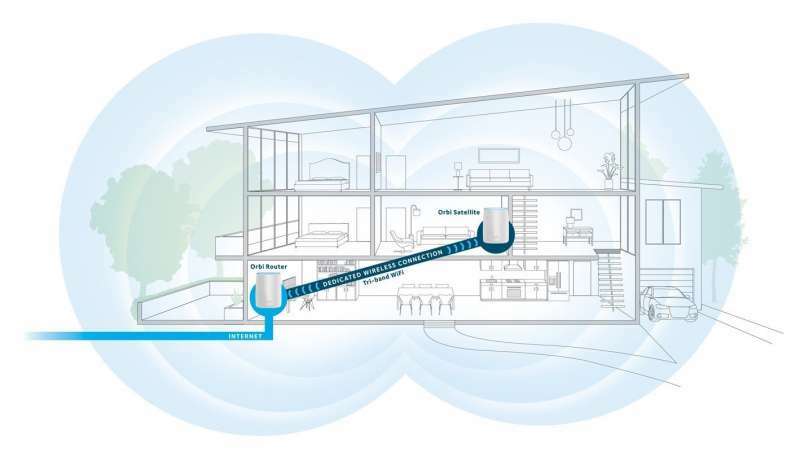 The Orbi base station is also designed to connect to the internet and as a result has one WAN and three LAN ports while the Orbi satellite nodes have four LAN only. This allows the Orbi satellite nodes to operate as a wireless bridge to connect devices which may only have an Ethernet connection or don’t have access to the latest and greatest wireless technology. At the top of the Netgear Orbi is also some LEDs which double up as status indicators. 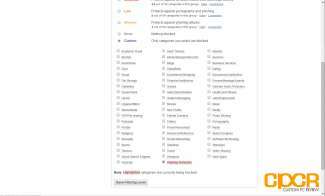 Here’s a list of status indicators along with what they mean. Your Orbi router and satellite are working normally. 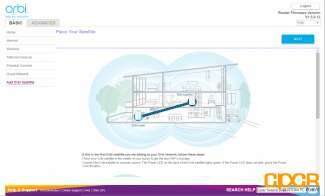 Your Orbi router and satellite are applying a configuration or updating their firmware. 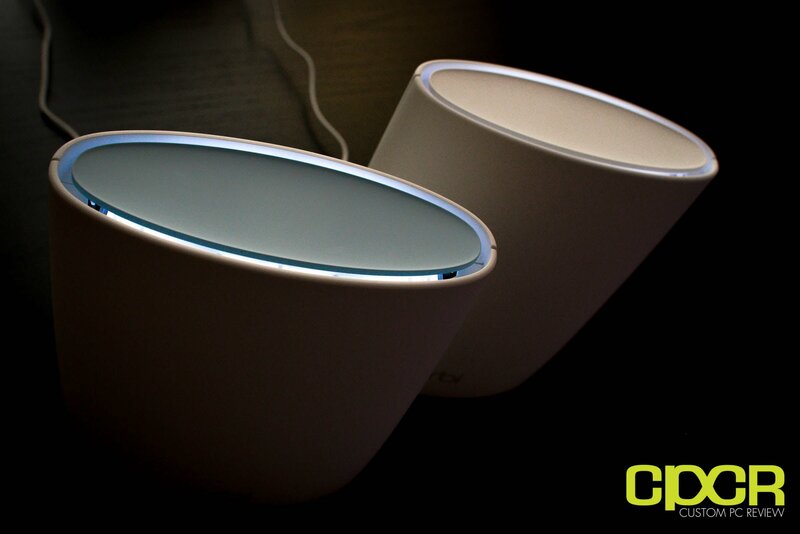 Your Orbi router is powering up. Your Orbi satellite is powering up. 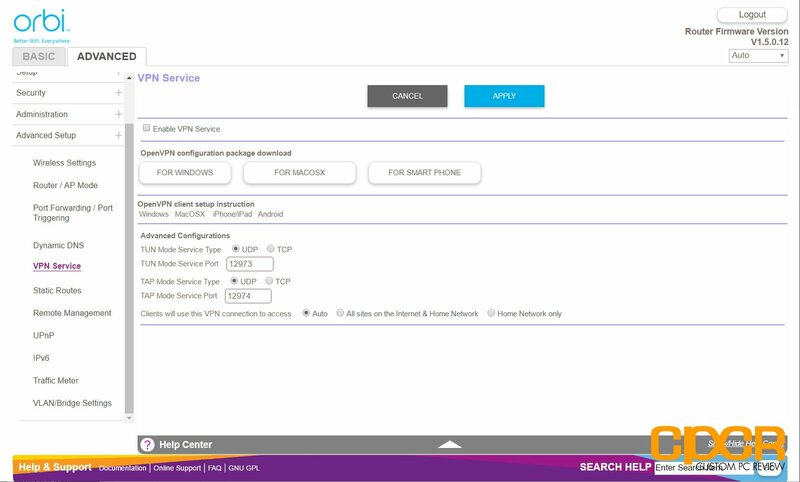 Your Orbi router ring LED might pulse magenta for the following reasons: the WAN port link is down, the router is unable to get the IP address from the modem or ISP, or the router is unable to connect to the Internet. 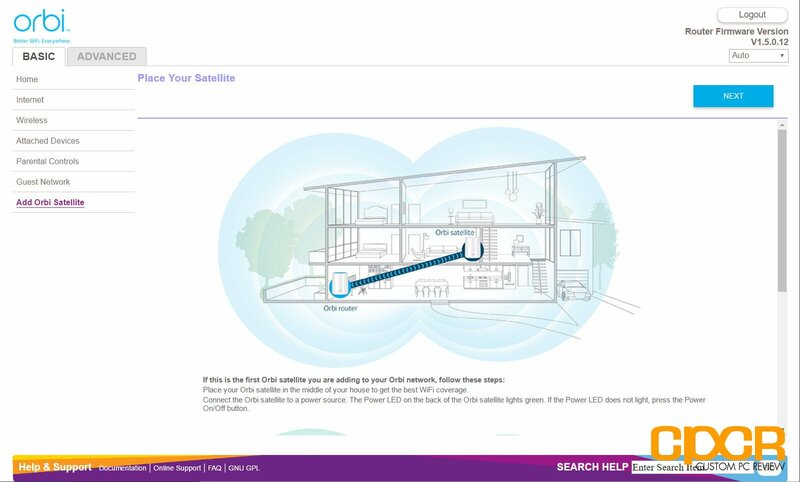 When your Orbi satellite’s ring LED pulses magenta for the first time, it means that your satellite is attempting to connect to your Orbi router. If the ring LED pulses magenta for more than one minute, it could be for the following reasons: the satellite lost the connection to the router or the satellite is unable to get an IP address from the router. 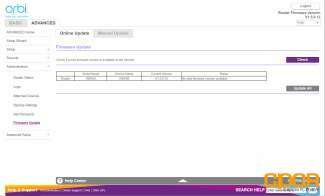 N/A Your Orbi satellite ring is solid magenta for 10 seconds if it is unable to obtain the IP address from the router. N/A If your Orbi satellite ring is solid blue for 10 seconds, the connection between your Orbi router and satellite is good. N/A If your Orbi satellite ring is solid amber for 10 seconds, the connection between the router and satellite is fair. 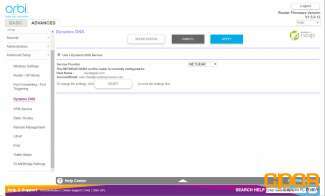 The Netgear Orbi is very flexible when it comes to configuration as it can be setup using a web interface, the Netgear Orbi app, or the Netgear Genie app. 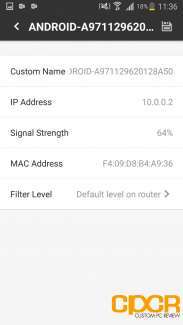 The Netgear Orbi web interface is the typical classic home router web interface you’re probably familiar with. 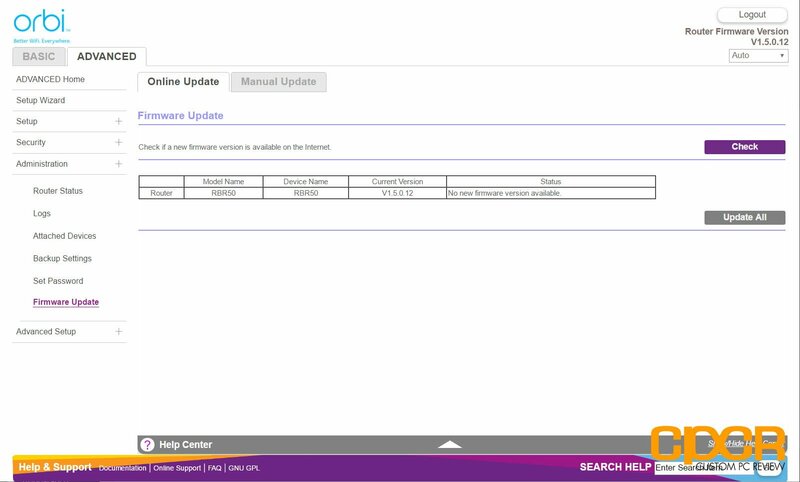 Netgear separates the web interface into a basic menu and an advanced menu with different settings. 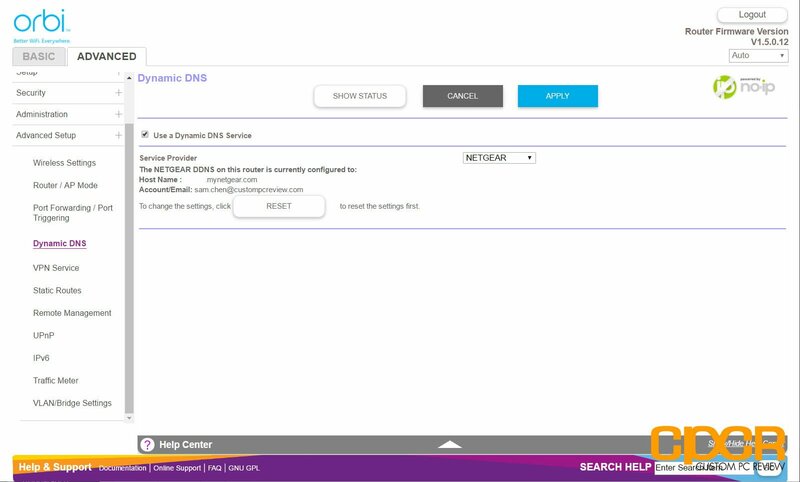 Initial setup of the Netgear Orbi can be done using the web interface. Among home mesh Wi-Fi systems, very few offer an advanced web interface with as many features that the Netgear Orbi offers. Netgear also offers the Orbi app which is an extremely basic companion app for the Orbi. Aside from basically getting on the internet, setting up Wi-Fi, monitoring who’s online, and getting the Orbi satellite node up and running, it doesn’t do a whole lot. 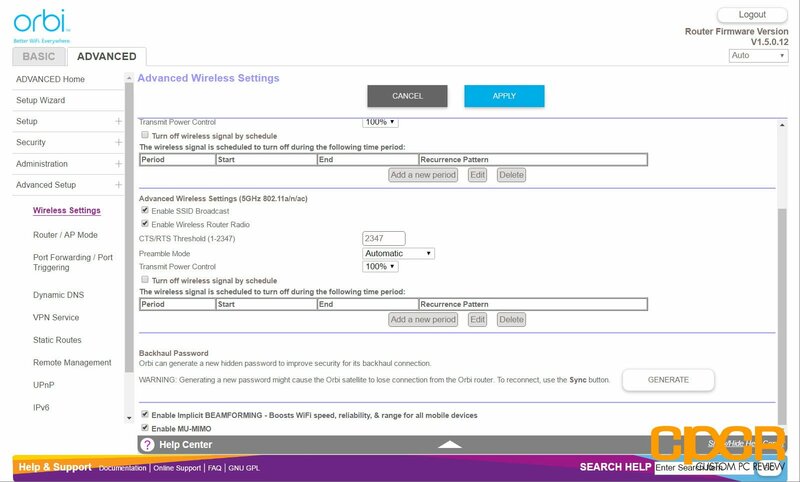 As an alternative, you can also use the Netgear Genie app which shows slightly more advanced settings and monitoring capabilities for your Orbi. That said, it’s not perfect. 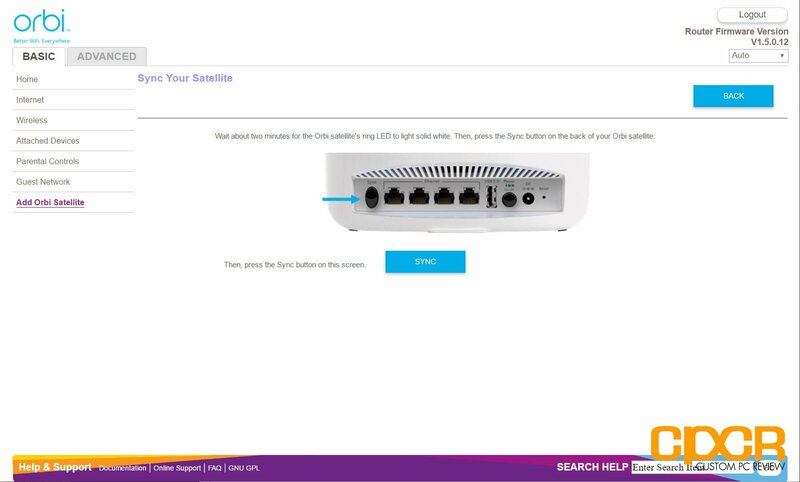 For example, you can’t setup a new satellite node using the app so you’ll have to go to the web interface or download the Orbi app to do it. Routing performance is tested using two systems. 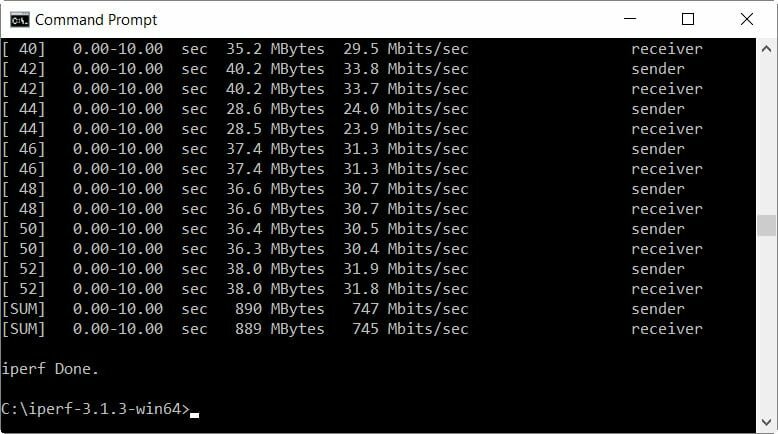 The first is a server using an Intel PRO/1000 Dual Port Server Adapter EXPI9402PT is connected directly into the WAN port of the router. The second is a client using an Intel PRO/1000 Dual Port Server Adapter EXPI9402PT is connected directly to the first LAN port on the router. 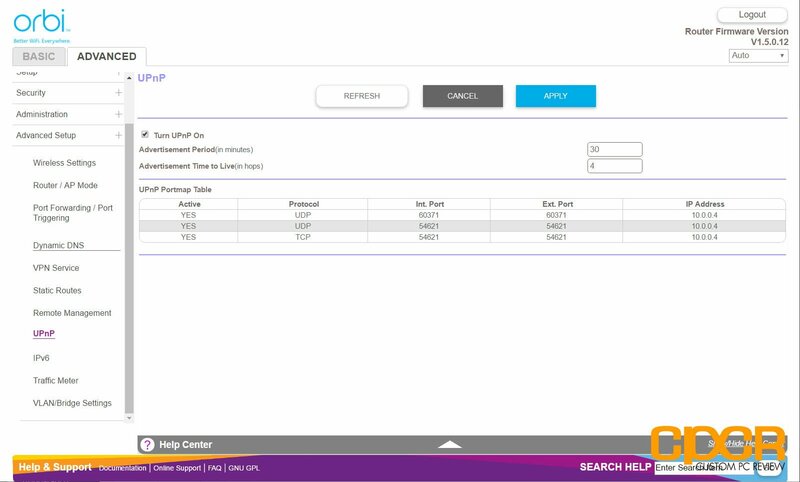 Transfer speeds between the systems are then tested using iPerf 3.1.3. 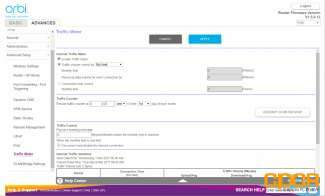 No issues were present when routing between WAN and LAN networks. 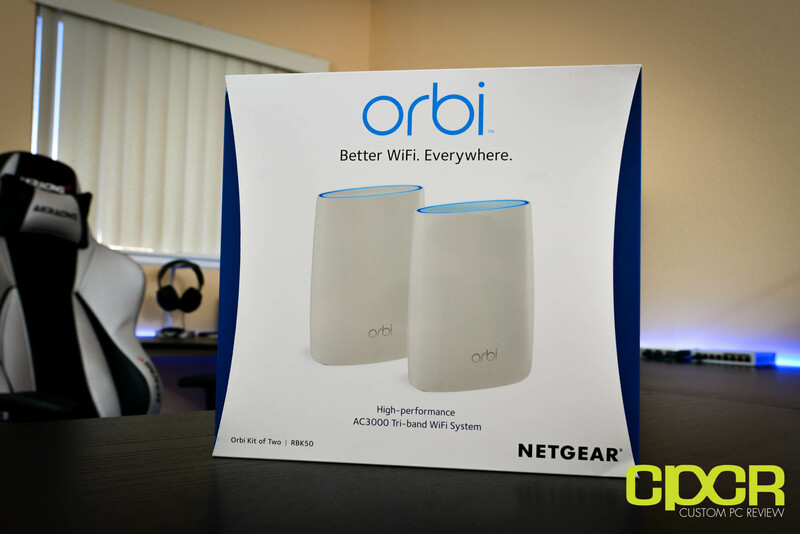 The Netgear Orbi was able to reach gigabit level performance without issue. 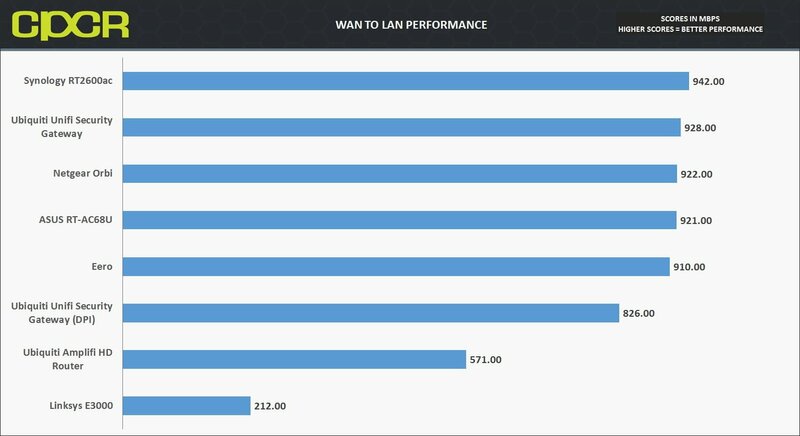 Wired performance is tested by connecting two systems, one server (Realtek 8111GR) and one client (Killer E2400), via their Gigabit LAN ports to the gigabit LAN Ethernet ports on the router. 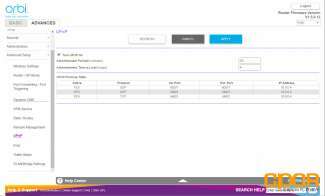 Transfer speeds between the two systems is then tested using iPerf 3.1.3. No issues were present when routing between wired clients within the LAN network. 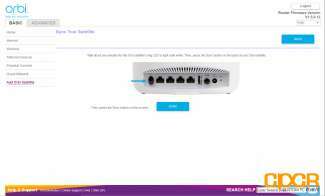 The Netgear Orbi was able to reach gigabit level performance without issue. 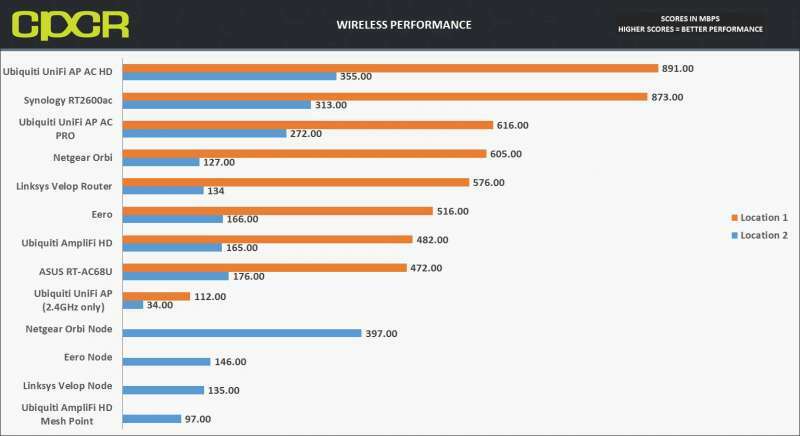 Wireless performance with a single Netgear Orbi was overall good but average for a a 2×2 AC Wi-Fi system. In testing, the Netgear Orbi was able to achieve 536Mbps in Location 1 with direct line of sight. In Location 2, performance dropped substantially to 127Mbps. 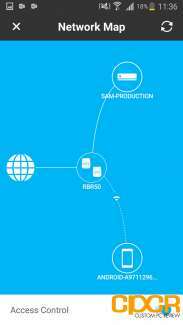 Wireless performance with the satellite Netgear Orbi node was very impressive. When testing in Location 2, we were able to achieve 397 Mbps, which is nearly 3x faster than the closest competitor, the Eero. Unlike the Linksys Velop which also has a dedicated backhaul radio yet fails to perform in a meaningful way, Netgear’s dedicated backhaul clearly works and works very, very well. Backhaul performance is tested by connecting two systems, one server (Realtek 8111GR)to the Orbi base station and one client (Killer E2400) to the satellite node. After connecting the Orbi base station and the satellite node, the two units are placed approximately 5 feet apart. With the satellite node acting as a wireless bridge for the client device, a transfer is then initiated between the server and the client to test the connection between the two. Backhaul performance is clearly very good. The two Orbis were capable of speeds up to 746Mbps, which is very impressive. That said, this testing is more of a best case scenario test to measure maximum performance. 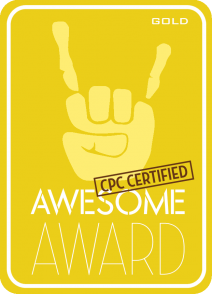 As with any wireless technology, your mileage may vary based on a wide range of factors. 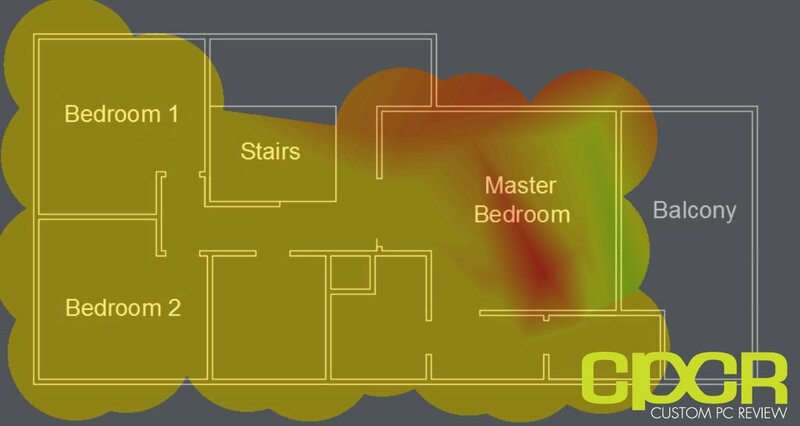 The results of the Netspot Wi-Fi survey was very interesting with the Netgear Orbi. Signal strength was surprisingly powerful on the second floor where the Orbi base station was located. 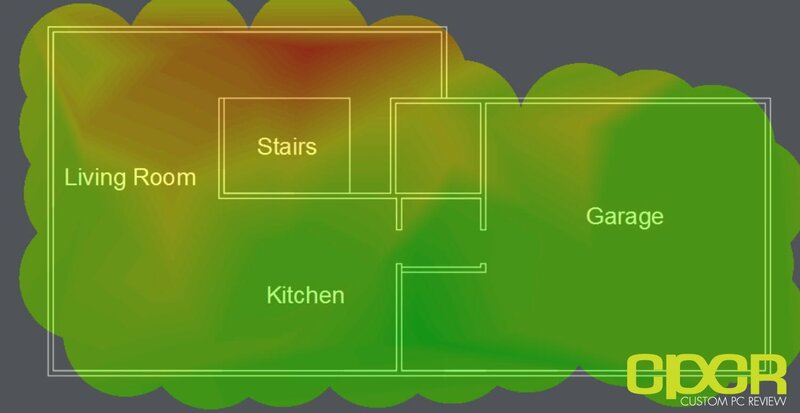 As we transition to the Orbi satellite node in the first floor, signal strength isn’t nearly as powerful, but the entire floor is still very well covered in Wi-Fi signal. 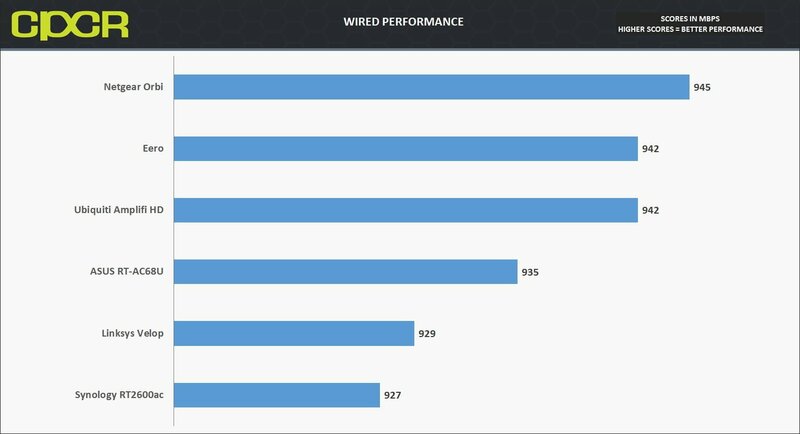 Looking at the results of our testing, it’s clear that the Netgear Orbi is by far the best home mesh Wi-Fi system out on the market today. Netgear has done a stellar job with their wireless backhaul system and in testing, the satellite node was able to produce speeds of nearly 400Mbps, which is nearly 3x faster than its nearest competitor. As the whole point of investing into a mesh Wi-Fi system is to improve coverage and performance wirelessly, the Netgear Orbi hits the mark in this regard. Furthermore, in addition to great performance, the Netgear Orbi also happens to be the most feature filled of the bunch, offering features such as parental controls, VPN, VLAN, DDNS, static routes, and more typically not found on home mesh Wi-Fi routers currently on the market today. 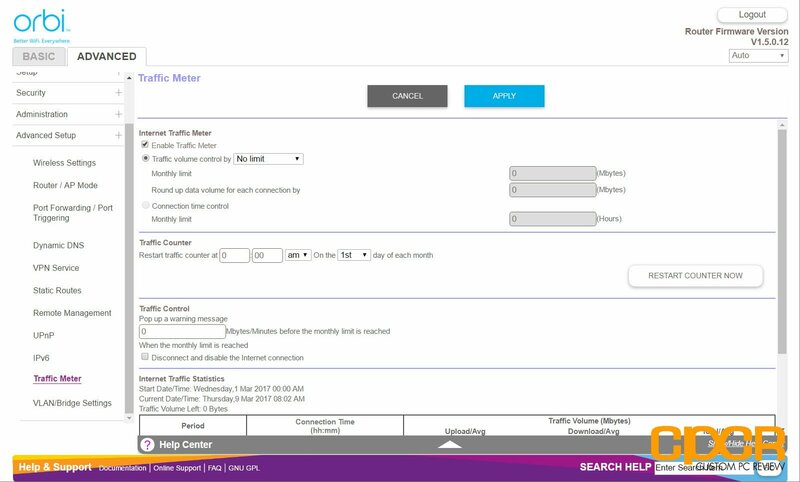 While it’s nice that many companies are trying to simplify networking for more novice users, as a more advanced user, it’s nice to see more advanced functionality provided. As far as issues, there’s very little to say about the Netgear Orbi. During the testing period, it performed well, and it was rock solid stable. However, if there’s one thing that needs some improvement, the web interface and the apps could definitely could use a bit more polish. 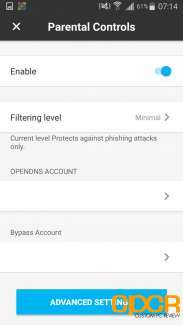 The Orbi app for example is painfully under-featured as very little configuration can be done on the app. 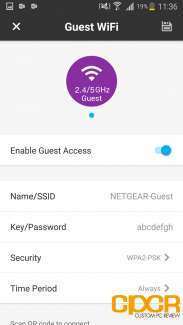 In order to get more functionality, you have to use the Netgear Genie app, but even then the app is nowhere as easy or as intuitive as the interfaces for the Eero or Ubiquiti AmpliFi HD. The web interface on the other hand is usable and provides all the functionality needed for the operation of the Orbi, but with an interface that looks like it came from a device over 10 years ago, it needs a serious bit of work as well. Pricing on the Netgear Orbi is currently $349.99 for the two pack of Orbis which according to Netgear will cover up to 5,000 sq ft. Considering it’s $349.99 for just a two pack, the Orbi is significantly more expensive than most of its competitors with the exception of the Linksys Velop which is similarly priced. However, the Netgear Orbi is very fast and is the only home mesh Wi-Fi system that aims to improve both coverage and performance, and does a great job at it. Overall, if the high pricetag is no issue, the Netgear Orbi is highly recommended!